Vivago proudly presents, Vivago MOVETM, the newest member of the product family. Built for the needs of active people – Simple and stylish, yet capable of amazingly many things! Vivago MOVETM measures activity, sleep and circadian rhythm, using a movement sensor. The measured data are sent to a mobile application via bluetooth, and the application will further send the data to cloud for analysis. It’s the analysis and presentation of data that makes Vivago MOVETM unique. By turning data into information, solution can offer the watch user, their family members and care personnel the information that is relevant, real time and actionable. Vivago MOVETM watch comes in stylish colors – designed for wearing 24/7. Unlike most commercially available devices, Vivago MOVETM is approved for professional use in healthcare. The criteria for a medical device are strict, and allow no compromises when it comes to quality and patient safety. Vivago MOVETM is based on two decades of research and development. Its unique sleep algorithms have been developed with clinicians, for clinicians, and are based on solid science and sleep medicine. Vivago MOVETM is developed and manufactured in Finland. 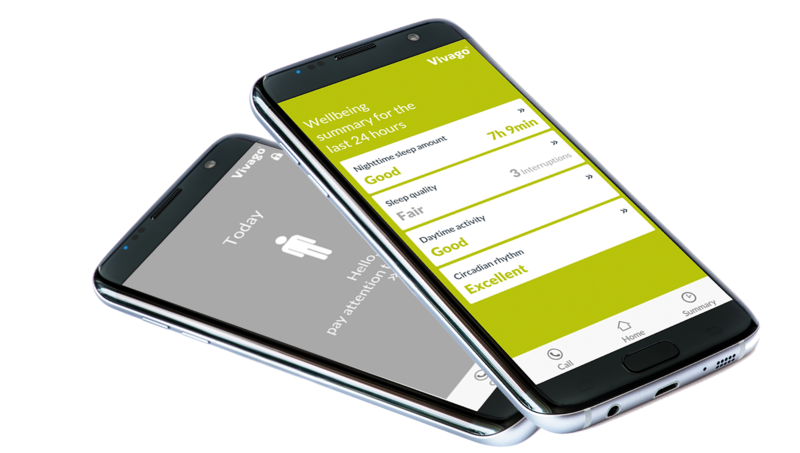 Vivago MOVETM enables the follow-up of wellbeing and security for the user, peace of mind for their loved ones and more information to for the clinician. First and foremost, it is a tool for improving care processes to deliver more personalized and timely care. We like to call is Smart Care: bringing digitalization to the service of wellbeing. Wellbeing summary in a nutshell, easily accessible anytime.